Feeding hummingbirds can bring great entertainment and joy to a birder's yard, but it is critical that birders not put hummingbirds at risk with the food they offer. 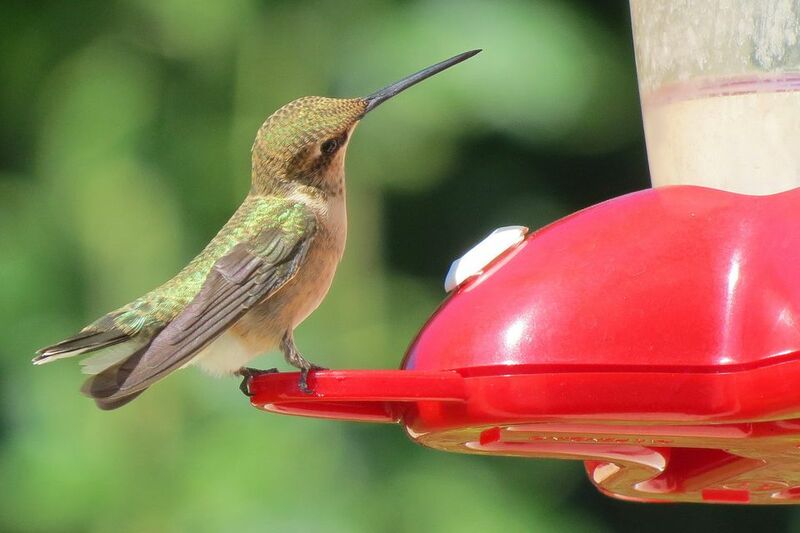 Because hummingbird nectar is clear, it is easy to assume it is always fresh and nutritious for birds, when in fact it can spoil just as easily as any other birdseed, suet or other foods. So how can you tell if hummingbird nectar is bad and needs replacing? Nectar is a simple mixture of sugar and water, but when it spoils, it becomes something different. As the sugars break down into other carbohydrates, they are less nutritious for hummingbirds, and less easily digestible. Mold, fungus, and bacteria, all of which can be dangerous to hummingbirds, will grow in fermenting nectar. Furthermore, the strong odor of spoiled nectar can attract pests such as insects, rats, raccoons, or even bears, all of which can pose a nuisance or threat to both birds and birders. When nectar goes bad it can also thicken and crystallize, which can coat the bills and feathers of feeding birds or clog feeding ports so it is more difficult for birds to sip. Fresh nectar, however, will not be a health hazard to hungry birds and will flow freely through feeders so birds can eat more easily. One of the best indications that nectar has gone bad is that hummingbirds will no longer drink it. While birds may resort to sipping on spoiled nectar if other food sources are absent and they are desperate for a meal, most hummingbirds prefer to avoid bad nectar. If no hummingbirds are visiting a feeder, it is best to check the nectar for freshness and replace it if needed. All nectar will gradually spoil as the sugar solution naturally breaks down over time. There are steps you can take to keep it fresh and healthy for hummingbirds for a little while longer, however, to ensure less nectar is wasted and no birds are endangered by spoiled nectar. Use smaller hummingbird feeders that use less nectar. This will ensure more nectar is drunk before it has a chance to ferment. These feeders will need more frequent refills, but the smaller quantities of nectar are less likely to ferment before they are used. Make nectar in smaller quantities and only make as much as is needed to refill feeders. If larger quantities are made, store leftover, unused nectar in the refrigerator for up to 7-10 days to keep it fresh before use. Position hummingbird feeders in cooler, shaded areas out of direct afternoon sunlight, when the day's heat is more likely to promote faster fermentation and spoilage. Morning sun is cooler, but avoid full sunlight during the hottest part of the day. Clean and sterilize nectar feeders with every refill to avoid any immediate contamination that would start fermentation right away. Be sure to clean all small nooks and creases of a feeder, because even a small amount of leftover debris can contaminate a new batch of nectar. To keep nectar at its very freshest, it is best to use every technique possible. The more ways birders try to keep nectar from spoiling, the longer nectar will last and the better it will be for birds. Even with every precaution, however, hummingbird nectar will eventually ferment. There is a way to offer hummingbirds fresh, delicious nectar without worrying about any spoilage. Natural nectar sources such as nectar-rich flowers only produce tiny amounts of nectar, which is drunk or evaporates before it has the chance to go bad. Flowers then naturally replenish and refill their nectar reservoirs so there is always fresh nectar for hummingbirds to drink. Plan a hummingbird garden filled with nutritious, colorful blooms and every hummingbird that visits will have plenty of fresh, clean nectar to enjoy. Understanding how hummingbird nectar goes bad and why fermenting nectar can be dangerous is essential for birders to be sure they are offering hummingbirds only fresh, healthy nectar. Is Red Dye in Nectar Really Bad for Hummingbirds? Top 10 Hummingbird Nectar Mistakes - And How to Avoid Them! Hummingbird Feeders - Which Is Best?